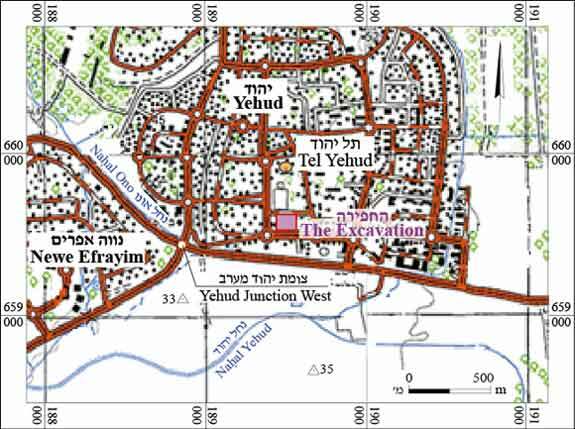 In July–August 2014, a salvage excavation was conducted on Ha-‘Azma’ut Street in Yehud (Permit No. A-7166; map ref. 189721–72/659497–589), prior to construction. The excavation, undertaken on behalf of the Israel Antiquities Authority and financed by the Azorim Company, was directed by E. Jakoel, with the assistance of Y. Amrani and E. Bachar (administration), D. Masarwa, L. Golan and R. Toueg (preliminary inspections and preparation of the excavation area), Y. Elisha, L. Drezner, A. Danziger, L. Nadav-Ziv and D. Shahar (area supervision), A. Buchennino, I. Horn, Y. Jack-Levi, B. Ovadiah, D. Ackerfeld, S. Leshem, G. Stern, G. Nirhan and D. Weinberger (assistant area supervisors), S. Ajami, T. Ajami and N. Elisha (data processing), U. ‘Ad and L. Weinblum (computing), R. Mishayev, R. Liran, A. Hajian, M. Kunin and M. Kahan (surveying and drafting), C. Ben-Ari and A. Dagot (GPS), A. Peretz and S. Ammami (field photography), Skyview Company (aerial photography), C. Amit (studio photography), M. Shuiskaya (field drawings and pottery drawing), P. Gendelman, R. Beeri and E. van den Brink (ceramics), D. Ben-Tor (scarabs), I. Ktalav (mollusks), I. Ziffer (cylinder seal), Y. Nagar and V. Eshed (physical anthropology), E. Kamaisky (pottery restoration), N. Marom (archaeozoology), L. Kupershmidt (metallurgical laboratory), D.T. Ariel (numismatics), D. Namdar (residue analysis), A. Cohen-Weinberger (petrography), A. Gorzalczany (scientific guidance), Z. Greenhut and N. Or-Lev (consultation). Additional assistance was rendered by Y. Levi, A. Azab, G. Itach, A. Shadman, A. Glick and M. Ajami. The excavation was conducted in the southern part of Yehud, c. 250 m north of Highway 461. Several archaeological excavations were carried out in recent years, following the rapid development of the town, and the remains that were discovered range from the Chalcolithic period to the Late Ottoman period (Jakoel 2015). One hundred and forty squares were opened. 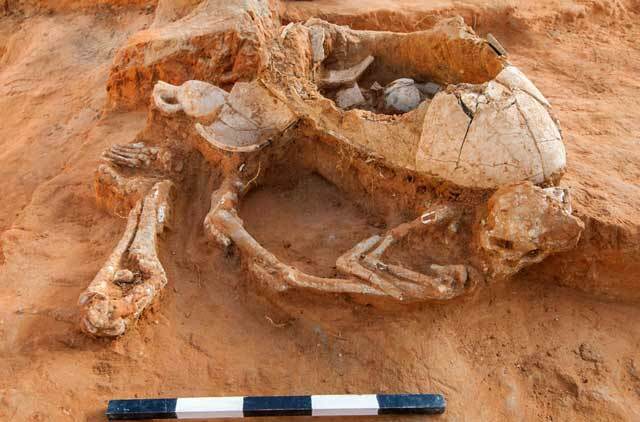 Remains dating to the Chalcolithic period, a burial field from the Middle Bronze Age, Late Bronze Age and Early Roman period, and an industrial winepress and several buildings from the Late Byzantine period were found. A number of tombs were found, but have not yet been dated. In addition, a few pottery sherds dating to the Iron Age were collected, as well as pottery sherds, glass and coins from the Persian, Hellenistic and Late Ottoman periods. Chalcolithic Period. Eight vertical pits (average diam. 1 m, depth 1–2 m; Fig. 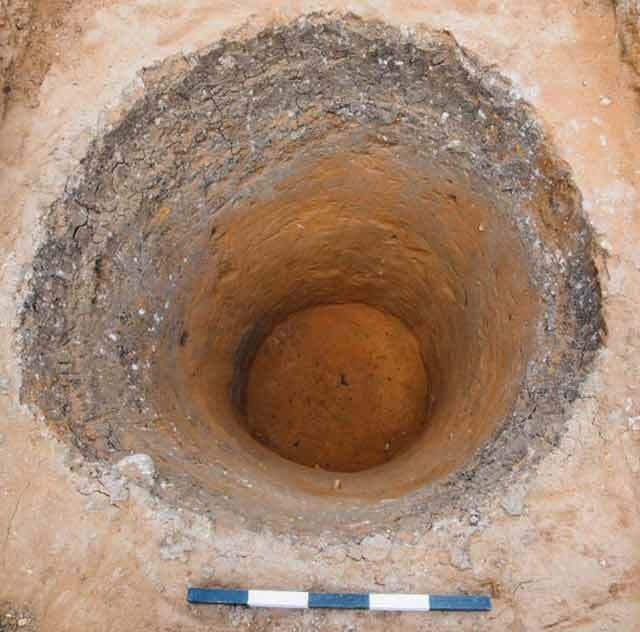 2) were exposed, most of them dug in the hamra soil that characterizes the lower level at the site. The accumulation of black or brown soil in the pits contained pottery sherds, basalt fragments and flint flakes from the Late Chalcolithic period, as well as animal bones. 1. Pottery: jars, open bowls of different sizes, carinated bowls, various types of jugs and juglets. 2. Metal objects: daggers and toggle pins. 3. Scarabs: mainly local imitations of Egyptian scarabs, bearing scenes from Egyptian mythology and floral patterns. 4. Animal bones: primarily of goat and sheep that were placed beside the deceased, usually in open bowls. 5. Jewelry: several beads, a ring and a cylinder seal decorated with floral designs. A concentration of broken pottery was discovered in the southeastern part of the excavation area, possibly a favissa (a pit with a cache of vessels that were no longer in use). It contained mainly open bowls, oil lamps, goblets, juglets and several miniature vessels. Many of the vessels were burnt. 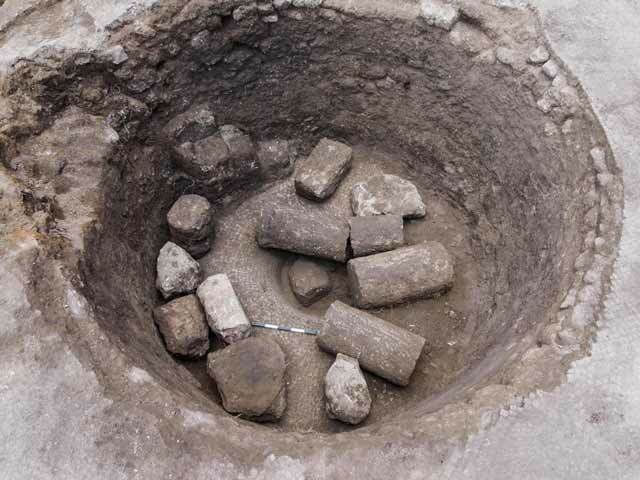 No burials were found nearby, and this cache may be evidence to ritual, or to a ceremony associated with burial. Late Bronze Age. The site continued to be used as a burial ground, especially in the northern half of the excavation area. Some fourteen tombs were exposed, most of them pit graves that were dug in the hamra, aligned in different directions (Fig. 4). The deceased were placed in supine position, with a variety of pottery vessels, scarabs and beads. 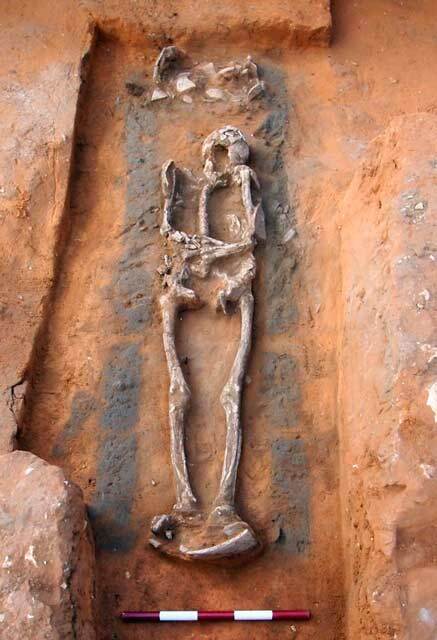 The burials included adults and children, of both sexes and with a wide range of ages. This is the first evidence to activity at the site at this period; only fragments of Late Bronze Age pottery vessels were discovered in previous excavations. Persian and Hellenistic Periods. Pottery sherds were found, but no architectural remains. The pottery was well-preserved, showing no signs of wear, and constitutes evidence of human activity near the excavation area during these periods. Early Roman Period. The site was used as a burial ground during this period, particularly in the southern part of the excavation area. At least twenty-five tombs were exposed, representing three types: cist graves built of limestone, with a covering that was not always preserved (Fig. 5), rectangular built cist graves, some of them covered (Fig. 6), and simple pit graves (Fig. 7). All the tombs contained a single primary burial, in a supine position. 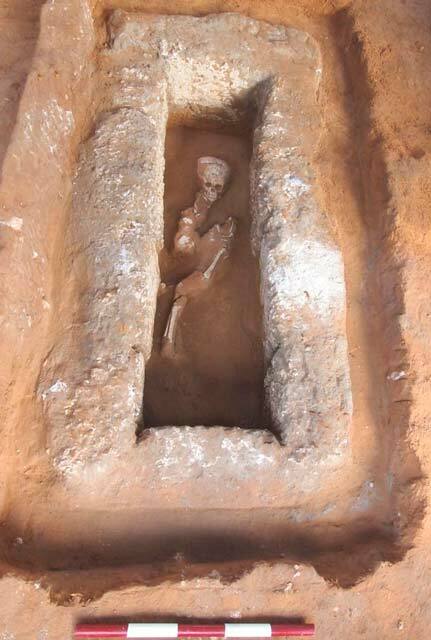 The orientation of the burials varied, and most of the graves were devoid of funerary offerings. 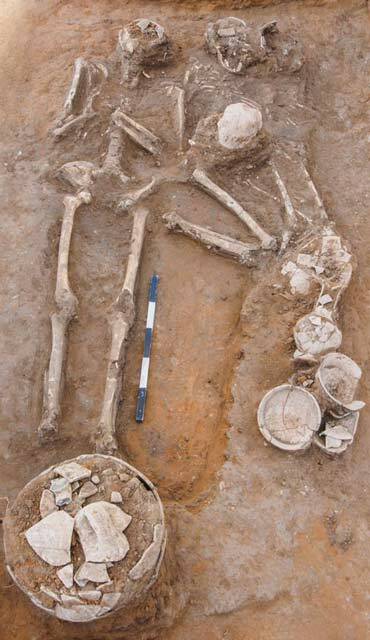 Pottery vessels were discovered in several of the graves: cooking pots, jars and unguentaria. Other finds included glass vessels, stone vessels and unworked stones. A fragment of a stone vessel (kalal) in one of the graves suggests that the deceased was a Jew. This is the first necropolis discovered in Yehud that dates to the Early Roman period; hence its importance. Late Byzantine Period. During this period the nature of the site changed, from a burial ground to an industrial and residential area. 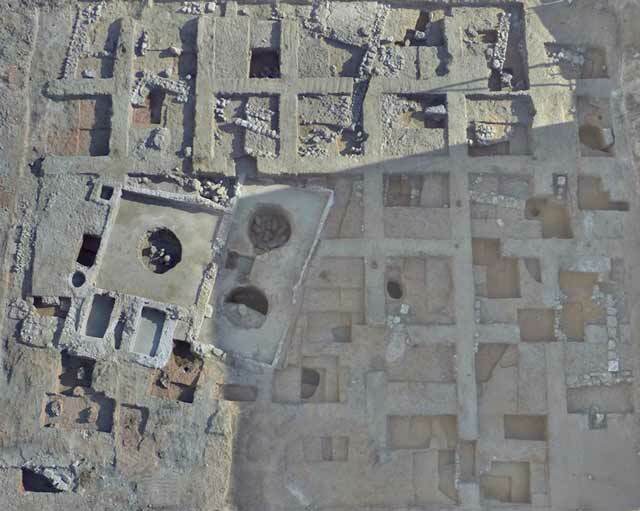 A large winepress surrounded by several buildings, some of them dwellings, was exposed (Fig. 8). The industrial winepress was a complex installation (c. 120 sq m), and most of its elements were paved with white mosaic. It was constructed on an east–west axis, and sloped to the east, allowing the must to flow in that direction. In the center of the treading floor there is a place for a wooden screw, which was not preserved. Rectangular surfaces paved with mosaics were discovered around the main treading floor, with a through-hole in the wall they shared with it. As the grapes were trodden, the must flew to collecting vats east of the treading floor. The vats were paved with white mosaics, and their walls were coated with plaster. There was a round sump in the center of their floor, and a staircase was discovered in the northern vat (Fig. 9). The grapes were apparently placed on the surfaces prior to treading, and the first wine was sometimes also produced there. The size of the winepress attests to the profuse quantities of wine that was produced, not solely for domestic consumption, but for commercial purposes. The winepress and the buildings went out of use in the mid-seventh century CE. Apart from several fragments of pottery vessels ascribed to the Late Ottoman period, no evidence of later habitation was found at the site. The finds from the excavation contribute information which is important for the understanding of the settlement at Yehud through the periods. 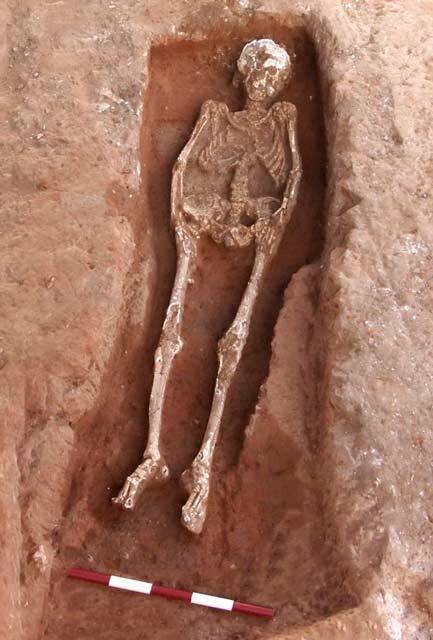 The funerary and industrial nature of the remains that were discovered indicates that the area was located on the outskirts of the settlement and was uninhabited in most of the periods. The results supplement evidence of previous excavations at Yehud and in the Ono Valley, and contribute considerably to understanding the development of the region over time. Jakoel E. 2015. Yehud, Zionist Congress Street. HA-ESI 127. 2. A pit, looking west. 3. A tomb, looking north. 4. A tomb, looking west. 5. A cist tomb built of limestone, looking west. 6. A cist tomb built of mud bricks, looking south. 7. A pit grave, looking east. 8. The winepress and buildings, aerial view. 9. The northern collecting vat, looking north.